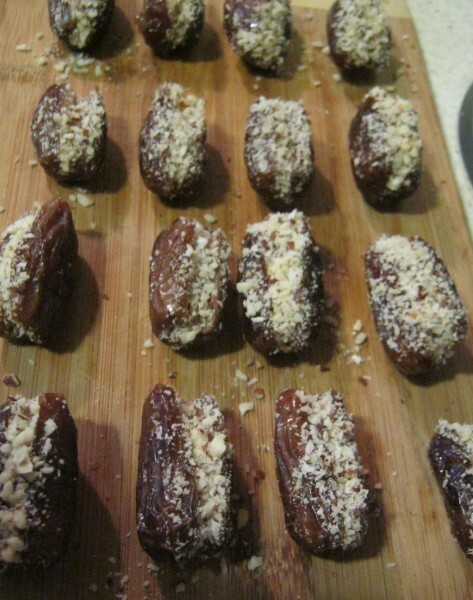 Originally, these dates were destined for date bread; but these chocolate covered stuffed dates were so delicious that I am glad I changed my mind! Not only is this simple dessert only 4 ingredients, but by using chocolate with a minimum of 70% cacao it is also a health conscious dessert. I used white chocolate because I happened to have it on hand when inspiration struck, but using dark chocolate would remove any dessert eating guilt…and I will definitely make these again and again; they are that good. I am already imagining making these as Christmas gifts (if you are related to me – you didn’t see that!). Process hazelnuts and coconut together for a few seconds using a food processor. Slice one side of dates open lengthwise and remove pits. 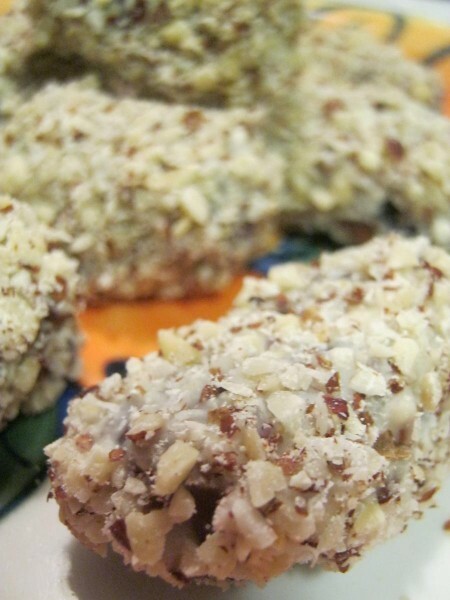 Use a spoon to stuff dates with nut mixture. Melt chocolate in a small bowl in microwave. Microwave for 10 seconds at a time, stirring after each time (this will probably only take a total of 20 – 30 seconds at the most). I had dinner in the oven while making these, so I placed the bowl of chocolate on the warm stove top to keep it melted. You may need to reheat if it cools too much. 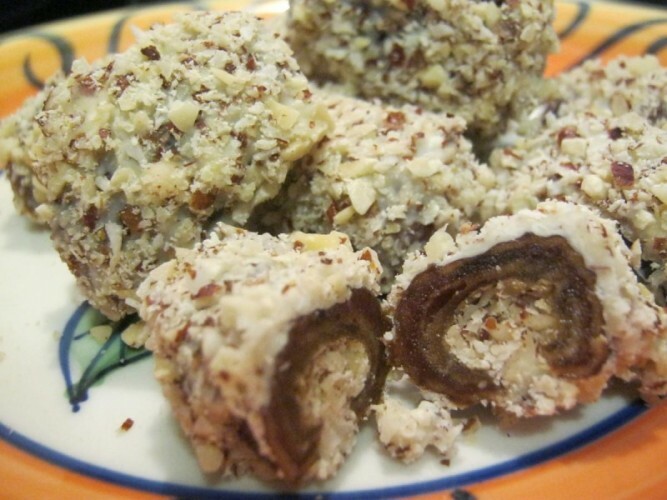 Roll dates in chocolate to coat and allow excess to run off into the bowl. Do this in small batches of 4 – 5 dates so the chocolate doesn’t harden up before you have a chance to roll them in the nut mixture. Roll chocolate coated dates in remaining nut mixture to coat and organize them on a plate leaving a little space between each one. Once you’ve finished coating all the dates in the hazelnut/coconut mixture, let them chill in the fridge for an hour or so to set chocolate. The whole process took about 20 minutes (plus the hour in the fridge). You may want to hide them if you’re trying to save them for dessert! After we taste tested these, I caught my uncle sneaking back for more of them, more than once! WOW!!! This is making me drool galore. Love everything about this recipe. Will try it out soon. I’m going to try them again soon too lol. Did you make them Alina? I’m not a huge date lover but this looks so good. Holy moly- these sound amazing. Dates are natures candy- so healthy and so delicious! What a creative recipe! Looks delicious! You are welcome, I hope you try them, they are delicious! That is interesting. They look good. I love dates. OMG, they sound so decadent but delicious! This looks very yummy! Would love to try this! Thanks San. :) I hope you’ll come back and let me know if you try them! What a great idea! Our family looooove bacon wrapped dates with a nut in the center and nuts covering would be delish. I meant to say a sweet/dessert version with nut covering! Bacon wrapped sounds amazing too, I am sure that would last all of 2 minutes in my house lol. These sound delicious. I find I steer away from buying ingredients that I am unsure what to do with. I like dates but never could find any neat recipes to try with them. I must say…even though I am a very picky eater, I don’t mind dates! They are like giant raisins…which I love! These chocolate covered stuffed dates sound delicious! These look very good. My husband would love for me to make this recipe.